Firefighters assess the scene as a house burns in the Napa wine region of California on October 9, 2017, as multiple wind-driven fires continue to ravage the area burning structures and causing widespread evacuations. 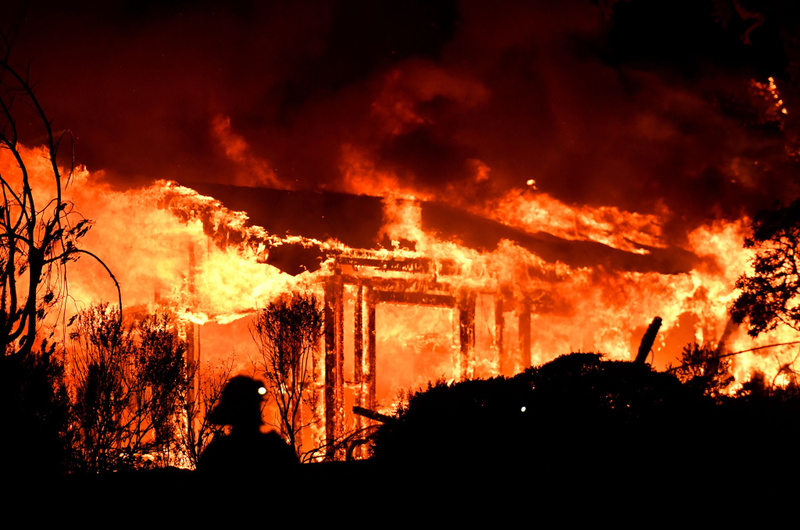 As reported by the Los Angeles Times, 24 structures were destroyed due to a blaze that broke around 9:20 a.m. Monday near the 91 Freeway and Gypsum Canyon Road. The fire also spread to the 241 toll road. Meanwhile, in the North Bay, firestorms have continued to rip through the Napa and Sonoma counties since early Monday, hitting Santa Rosa the hardest in what is its county’s worst natural disaster yet. So what’s the scene on the ground where these fires are spreading? And what is the expected damage? Larry speaks to reporters on the ground in Santa Rosa and Orange County for the latest.